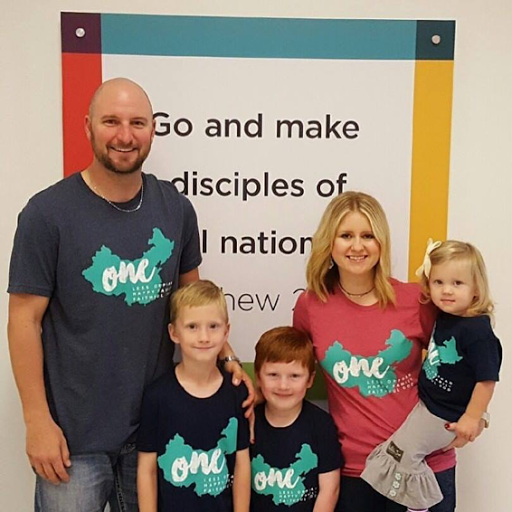 This month I would like to introduce you to the Richardson Family. "Hi. This is the Richardson crew and counting. My name is Brooke and my husband’s name is Tyler. We have 3 children; Aiden (7) Cooper (5) and Libby (2) and we live in our favorite city ever, McKinney, TX. 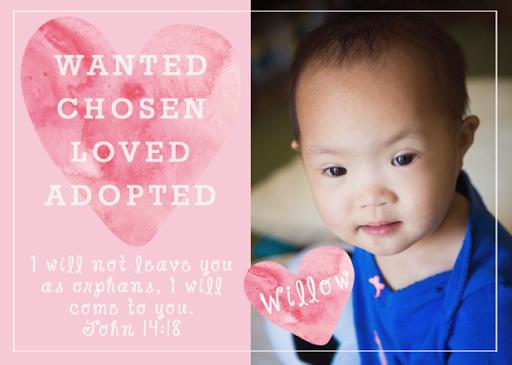 We are in the process of adopting a little girl from China and are hoping we can wrap our arms around her sometime in March or April of 2017. The wait has been tough but she is so incredibly worth it! My husband and I prayed about adoption for a while and then God really laid it upon our hearts to adopt a child with special needs. More specifically, down syndrome. 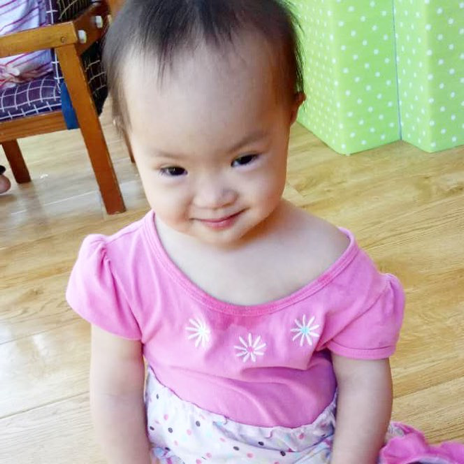 We knew how great the need was in China for children with downsyndrome and we felt confident God was leading us in that direction. Back up to January of this year when God had pressed upon my heart the name Willow. I quickly looked up a Willow tree to see what the meaning was. First off, its native to China but they are found in many other regions of the world today (including the United States). They are very feminine, pretty and most of all they are extremely strong as they can withstand harsh weather conditions. The branches can bend a great deal and not break. After reading this, I knew our daughters name would be Willow. It was perfect. A beautiful little girl, from China coming to her forever home in the States but leaving everything she has ever known and going through major changes and trauma in order to find her forever family. It would most likely be hard on her but she would be strong as she has already been so brave in the life she has lived so far. From then on, I dreamed of Willow and thought about her non-stop. I wondered how old she was or if she was even born yet. SO many thoughts about her wondered through my head. On July 19, 2016, I was just scrolling through facebook one day and I saw the sweetest little face of girl who looked so incredibly familiar. In China, they did not refer to her as Willow but as soon as I saw her…I knew. I will never forget the exact feeling I had when I saw her first picture. Overwhelmed. Speechless. Tears. Excitement. Nerves. She was Willow! That was her! I could feel it so deep inside that she was our daughter. I didn’t even realize it when I saw her picture, but I learned that she did have down syndrome. The more and more I learned about her, the more I fell in love. She is 2.5 years old although looks much younger. It wasn’t so simple though to just say Yes right then. My husband Tyler was about to leave on a medical mission trip to Zambia, Africa for a couple weeks so I knew we had to wait till he returned to really discuss and pray about her. This was our first adoption and we did not have first hand experiencewith down syndrome so at this point we were still a little nervous. We still are nervous in some regard,saying yes to adoption alone is a huge leap of faith. There are a lot of unknowns. With that said though, we are so incredibly confident that Willow is ours and we are already bursting out the seams with Joy! Less than a week after Tyler returned home, we sent our Letter of Intent in for her and began our homestudy. We did everything as quickly as possible and are ecstatic to have our Dossier (all of our adoption paperwork) sent to China. That’s such a huge step to get through. Most of what we can control on our end is over. Now we just pray for the process to keep moving along as quickly and as smoothly as possible. We know God is in Control and we trust him through every step of the way. There have been bumps but they just keep making us stronger and more willing to work harder to bring her to her forever family. She deserves to have all the love in the world from a family who will be by her side always. Our family and friends have been an incredible support system as well. To others whom barely know us, I’m speechless by your generosity and encouragement as well. Thank you! What a blessing social media has been to connect us with other families whom have walked these steps before us. We are so grateful for everyone praying for our family. The encouragement and prayers are definitely carrying us through. To follow more of our journey you can do so at www.lovetherichardsonlife@blogspot.com "
If you would like to be a part of helping this family bring their daughter home, please visit our shop We typically only keep available items in stock, but for a short time, we have listed the majority of our necklace designs and are taking PREORDERS. These items will ship on or before December 17th. Our necklaces make great inspirational gifts, and what better way to Christmas shop than to make purchases with a purpose!